Historically, Auto Row, the stretch of eleventh in the 50s, has been somewhat a no-man’s land to most, save for those rare New Yorkers who own a car. But with Hudson Yards pushing development westward, it’s now coming out of the shadows. One of these projects is Rafael Viñoly Architects‘ addition to 787 Eleventh Avenue, an Art Deco industrial building that was originally home to the Packard Motor Company when it opened in 1927 to the designs of Albert Kahn. 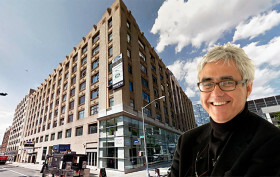 Viñoly’s $100 million commission is adding two stories off office space to the top of the eight-story building, converting the other floors to commercial space, and retaining the current auto dealerships on the lower five levels. 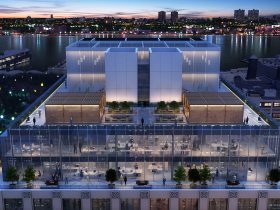 It’s been more than two years since the first renderings were revealed, and now the firm has released an additional batch that show aerial views of the addition, more office views, and a closer look at the 12,000-square-foot roof deck.